Well. This is it. I couldn’t believe that it went so quickly. I tried to take a few minutes every once in a while to just realise what was going on. 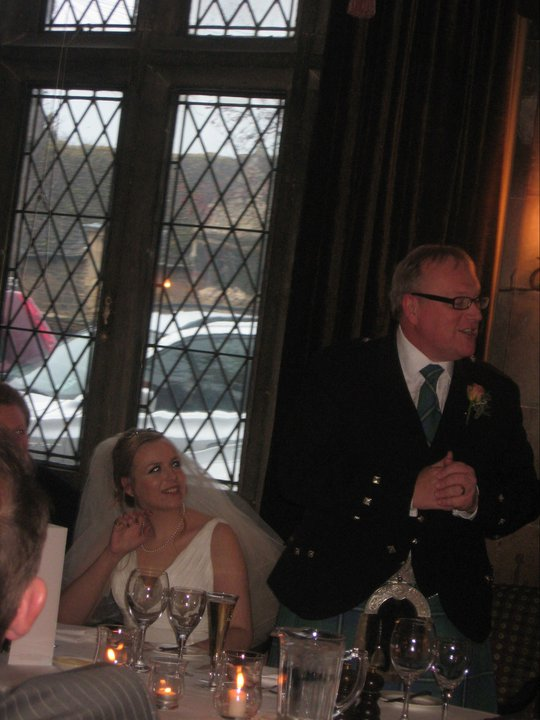 Whether it was at the church, in the car, sat at top table or drinking mulled wine I was grateful for every second. It was the best day of my life. I married the man that dreams are made of (well mine anyway) and I got to spend it with friends and family. It was perfect and I could not have asked for anything more. You can do all the planning in the world, but its the people that make you day extraordinary not the fact you have a candy buffet or a magician. Think about this when planning. I want to share with you a link to a video that one of Michaels friends did. It was taken on his iphone4 as a little gift to us. You can watch it HERE. Its quite lengthy. You can skip to the 23min mark to watch my first dance. Im sad its all over, but I still have little things to look forward to, such as getting back all the photos, our gift list goodies arriving and decorating our first proper home in all the photos and treasured memories from that day. Thank you so much for taking the time to indulge me by reading this, it means a lot. And a thank you to Miss Pickering. Not only was she my florist, she helped in times of nervousness, stressfulness and general wedding guidance and I am gutted I wont be able to see her as much now that the wedding is over. 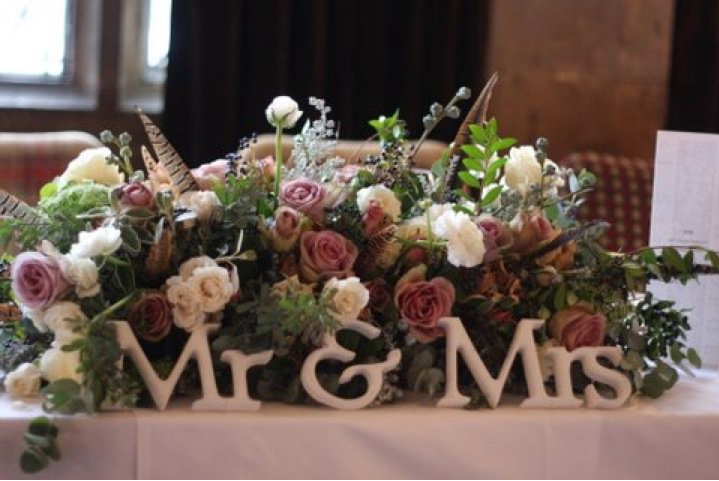 We were introduced for the first time as Mr and Mrs (I was still smiling) there were more cheers, camera flashes, more tears (namely by my father) and we were then seated at top table behind the beautiful flowers Miss Pickering had done. We ate, we drank, we enjoyed speeches, I had my photo taken more times than I care to remember but I started to realise that it was all going too quickly. 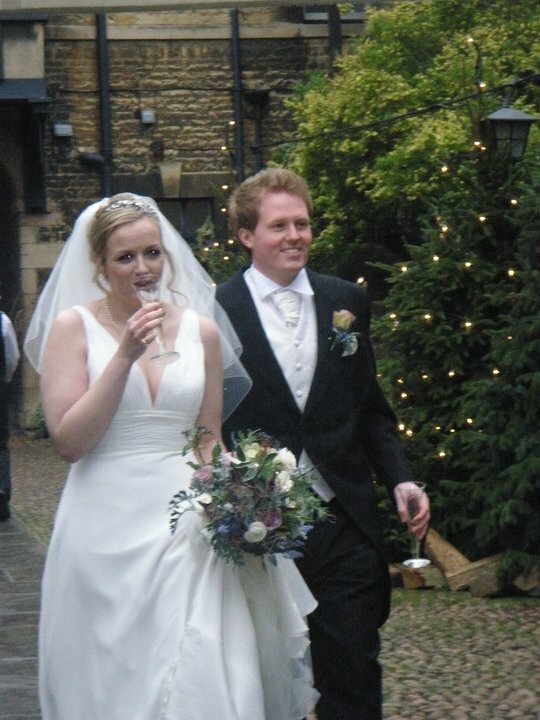 Before I knew it, it was 17.30 and my wedding breakfast was over, I had a little wobble. All the time planning, the little stresses, the bickering, all the effort was all zooming by. Technically it wasn’t nearly over as we had from 17.30 till carriages at midnight, but it was going too quickly and I didn’t want it to end. I didn’t want to take off my dress, ever, and I wanted little girls to keep calling me a princess in hotel toilets. The way Michael had looked at me all day made my heart skip a beat, my father was crying at any mention of “proud,beautiful, wedding” and in a few hours it was all going to be over. 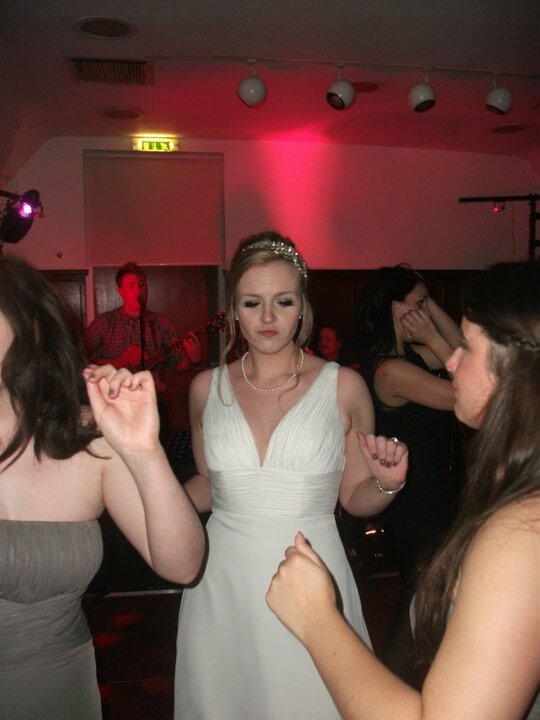 I dwelled for at least 30 minutes…naughty bride. I was then ushered up to my honeymoon suite where my bridesmaids and I cracked open some more champagne (can I just point out, I was continually drinking but never got drunk – thank you biology). I kicked off my wedding shoes, hoiked my dress over my knees and sat cross-legged on the bed with my four closest girl friends. Any blues I was having had disappeared, we were already reminiscing about the beautiful ceremony and the guests who travelled so far to be there, we laughed, drank, they tried on my veil and I was back in my wedding bubble. We touched up our make-up, spritzed, groomed, brushed and we were good to go. Evening guests would be arriving and the second flood of compliments were about to commence. Crap. That meant it was nearly time for my first “dance”. Nothing had gone wrong, and nothing did go wrong. But the moment I was dreading was about to appear. 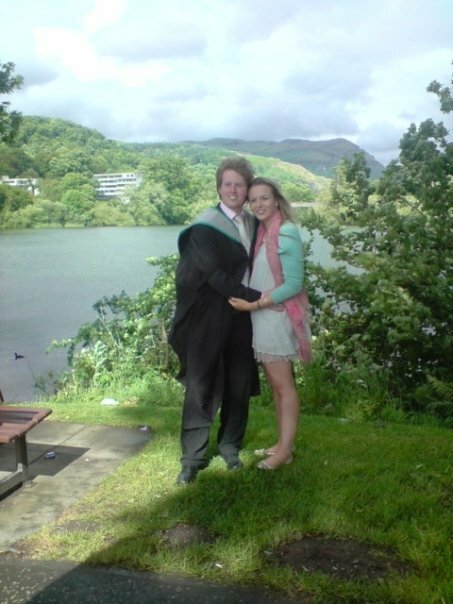 I am no elegant swan and Michael is definitely not a lordly lion (Harry Potter quote, enjoy). AND. It was captured on film. Which I will of course share with you. I met Joanne from VintageTwee on Twitter (@VintageTwee). She saved my life just before my wedding, providing me with some beautiful shades of ribbon and luggage tags. She was cool, calm, collected and was very helpful. 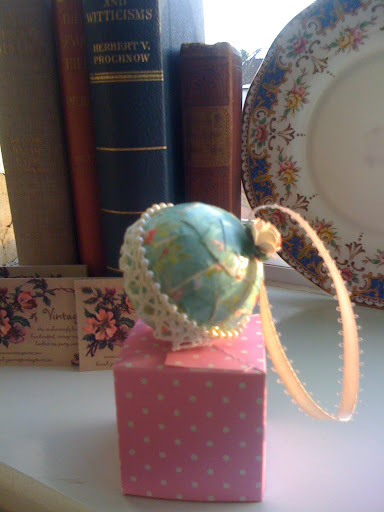 When I saw that she had some VintageTwee baubles I was beside myself. It arrived in the post literally 20 minutes ago. And here it is! 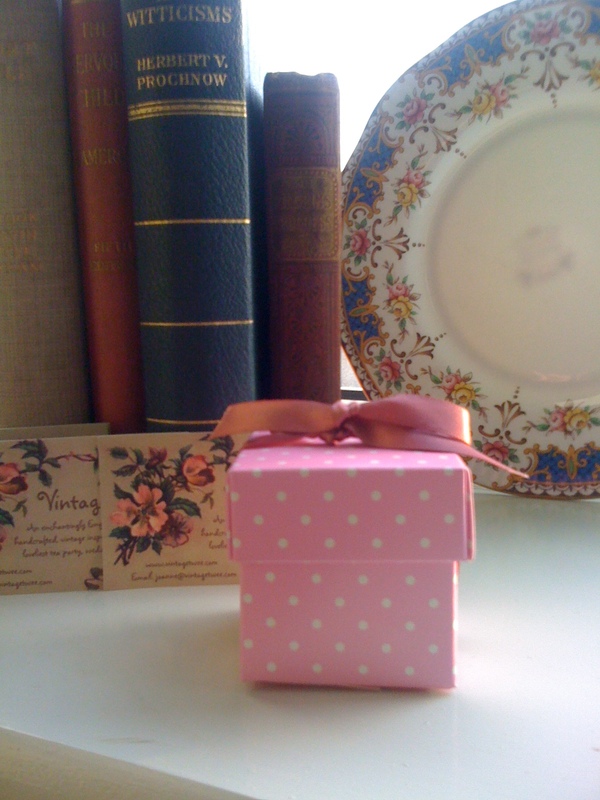 It came in a beautiful pink polka dot box, and snuggled inside was this beauty! Follow this link to win your own bauble. Please have a look at her website. 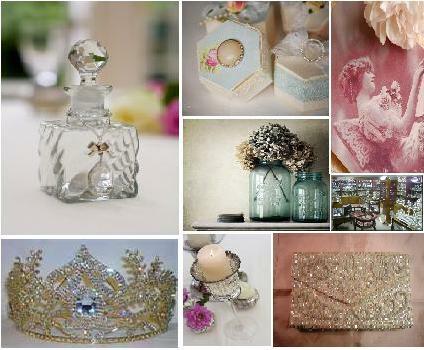 You will find beautiful hand crafted, vintage inspired table decor for any occasion. I am just sorry I met her after I had already bought all of my decor because I would have loved more VintageTwee at my wedding. We were in the Bentley. We were married and it was all so surreal. We had to take a little tour around Stamford to give the guests and photographer time to reach our venue. 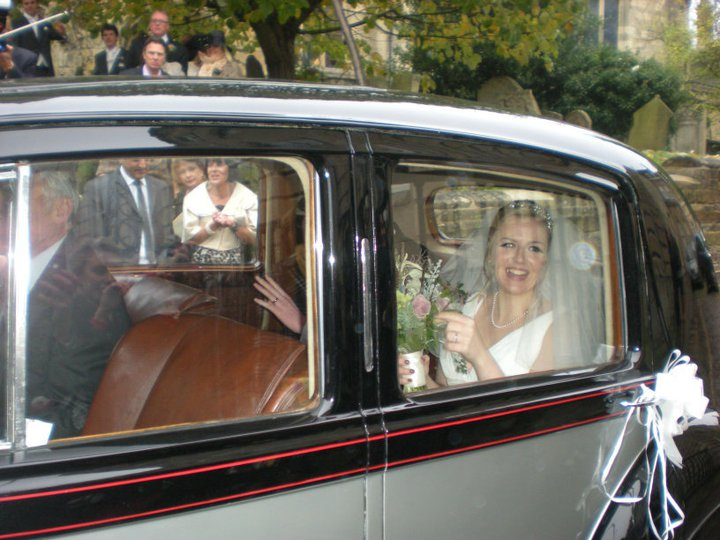 I was sat in the car in my wedding dress, next to my husband, driving down roads which I used to walk along when I was younger. I can’t remember what we spoke about in the car but I do remember tuning up to the venue and spotting the champagne, ready and waiting. Before getting out of the car Michael gave my hand a little squeeze, I think he realised I was starting to get a little flappy and nervous, thinking “here we go again”. I elegantly clambered out of the wedding car, clutching dress and bouquet in one hand I took the aforementioned champagne and savoured every bubble (it was at this point that I remembered I didn’t eat breakfast and it would go straight to my head) I smiled at Michael , took his arm and walked to where we were going to have all our photos done. Nearly a cold two hours and some mulled wine later it was time to be announced in to the dining room…Everything had gone perfectly so far. Surely something was going to go wrong? The moment I heard the opening chords to Jerusalem (greatest hymn ever written by the way) I knew we were now on cruise control. Michael and I walked up to the altar where we kneeled, said the Lord’s Prayer then went into a smaller part of the church to sign the register. The rest of the wedding party followed and Michael and I finally got a chance to talk. I couldn’t really say anything of worth, just that he looked wonderful and that my foot was hurting. I felt so relieved. The serious parts were over and now we could go on to the more social and appealing part of the day. 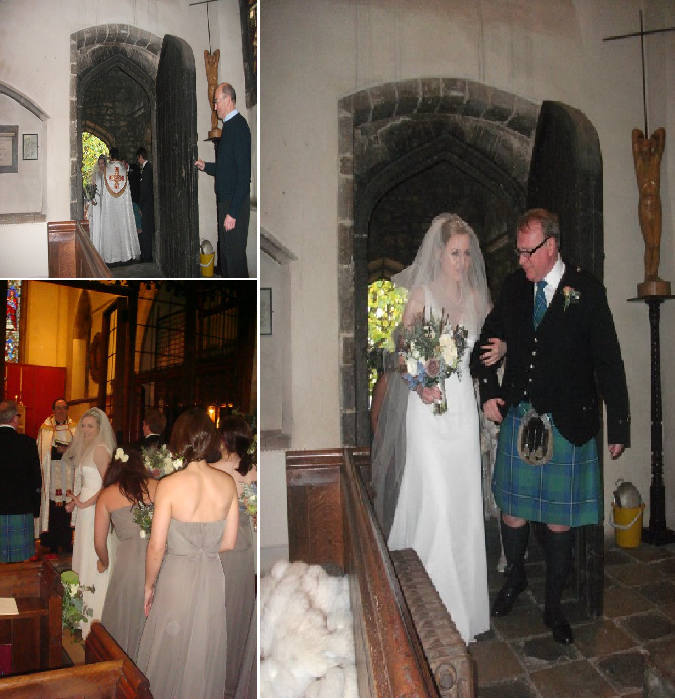 We then linked arms and started to walk down the aisle as man and wife. I couldn’t stop smiling and I had never seen so many flashing cameras directed my way before. We doubled back up the church for some more photos by the altar. Then it was time. The moment every girl waits for. The church exit as depicted in multiple romantic films. I got little giddy tummy jumps as we approached the ancient archway. Everyone was lined up in the very small (very slippy) graveyard. Clasping on to Michael for stability, I put an ivory cladded shoe onto the first step and strode into the dimming light, we were bombarded with confetti, met with cheers, whoops and of course sobs. It was perfect. And I was still smiling. 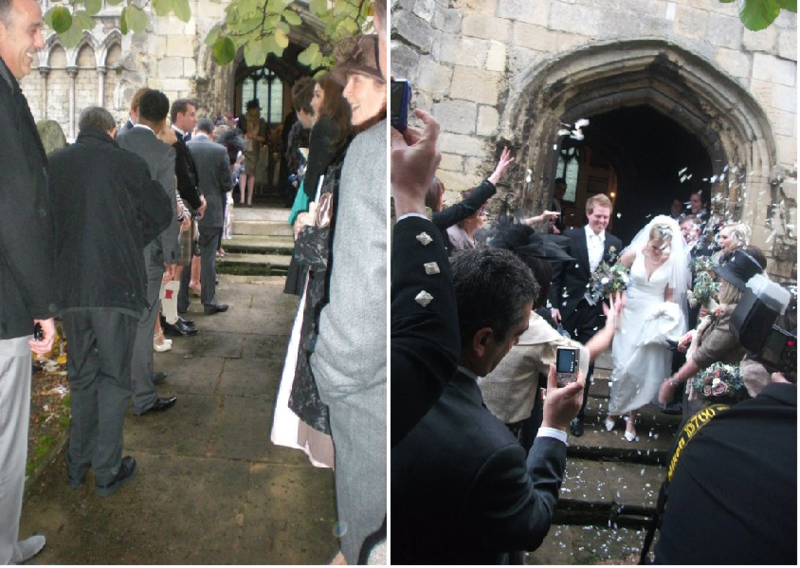 Arriving at the church is my most treasured memory of the wedding day. The ceremony it self still is somewhat of a blur up until the signing of the register. I gracefully got in to the car after having a few photos leaving the house. (It wasn’t graceful, more of a clamber). Dad sat next to me and asked me if I wanted a mint, (I never travel without them) he had hidden a stash in his sporran. The journey we were about to embark upon should have taken 3-4 minutes. On this Saturday, it took 20. A nerve racking 20. We stopped at every light. There was gridlock in town and two ambulances (ambulanci?!) attempted to get through the small cobbled lanes of Stamford. The church was within view and I was now a dramatic 10 minutes late. As we drove around the cobbles near the graveyard outside the church I got another little pang of nerves, hot flash and a tummy jump. I thought it could have resulted in a minor panic attack but then I saw her. 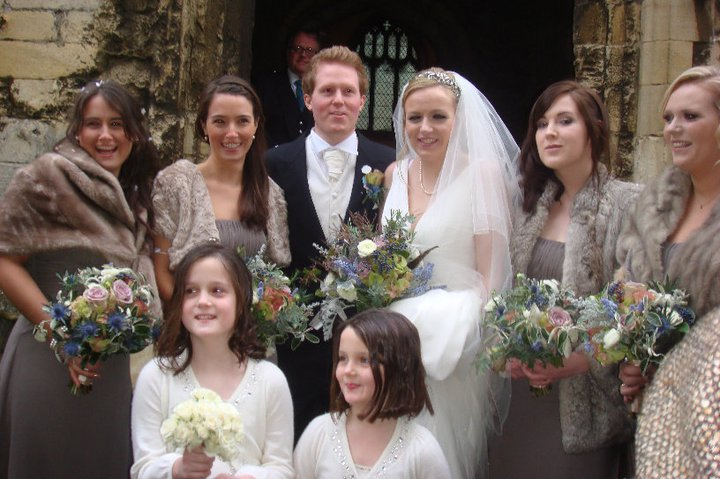 With a backdrop of a grey and miserable Stamford, she stood there in her taupe bridesmaids dress, fur coat and a beautiful bouquet. She had a concerned look on her face till we locked eyes and she smiled. A small crowd had now gathered at the entrance of the church, none of which I knew and it was so nice to see someone so familiar. My best friend of 19 years, my chief bridesmaid Katie. 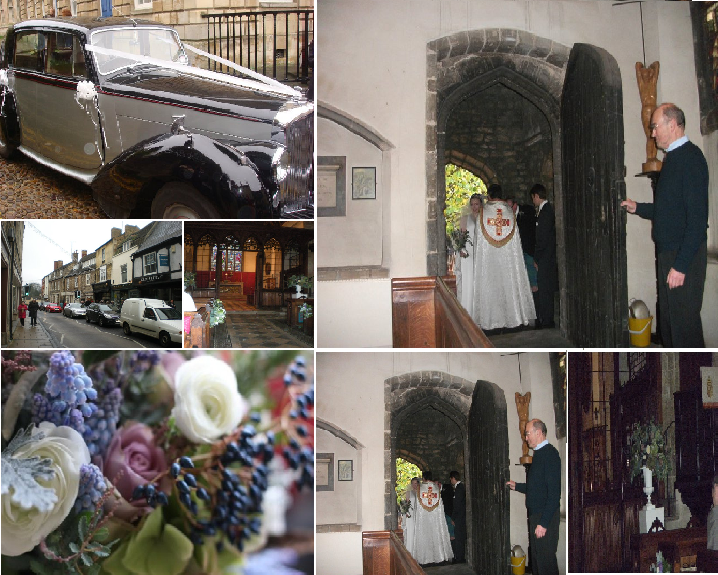 I “gracefully” got out of the car, had some photos with my dad, hugged Katie and made my way into towards the seemingly huge archway of the church. I was greeted by two of Michael’s ushers who I hadn’t seen in years and the rest of my bridesmaids and flower-girls. 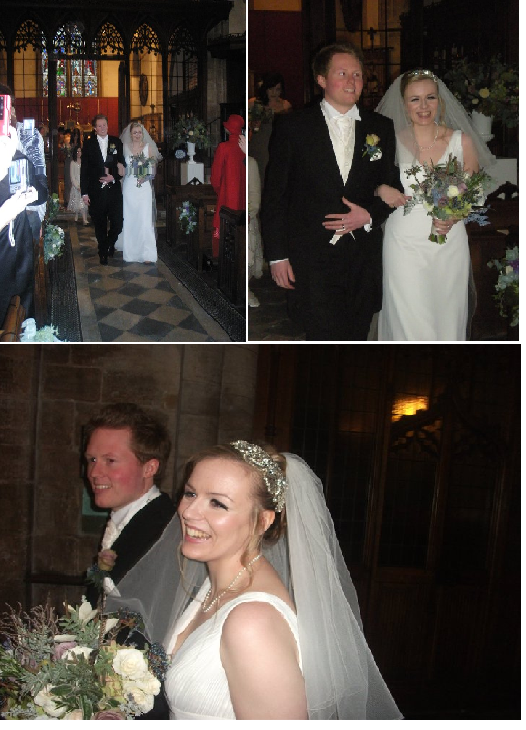 My veil was now over my face, I could hear Rachmaninoff,Rhapsody on the Theme of Paganini playing, and the Reverend was ushering me into the church. Deep breath. Quick glance at my Dad (who at this point was crying and continued to do so for the rest of the day) we linked arms and started to walk down the aisle. 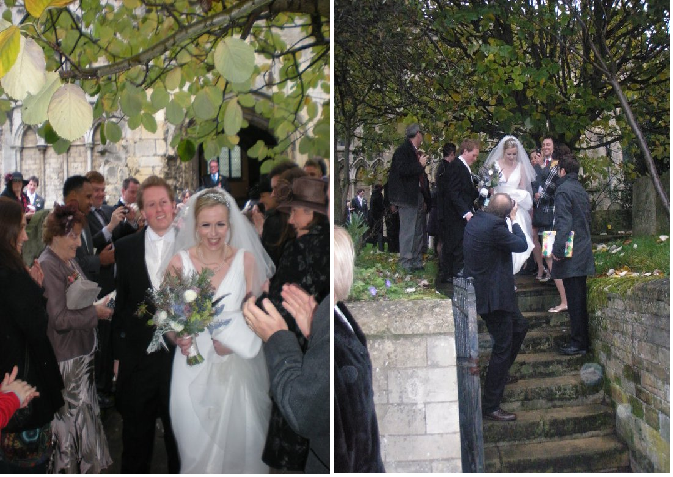 It was the most amazing and indescribable feeling, I could see Michael standing by the altar, there was a lot of camera flashing by my friends and family, then I was stood there. With a nod from my Daddy. I was nearly a wife. And I could not stop smiling. Miss Pickering and friends photos. The Thursday before my wedding, all was calm. I had two days to go. I had a variety of appointments all day, from a meeting with the florist to getting every inch of me waxed. My best friend and chief bridesmaid arrived, Michael was now staying too. It was fine. Then I woke up on Friday. 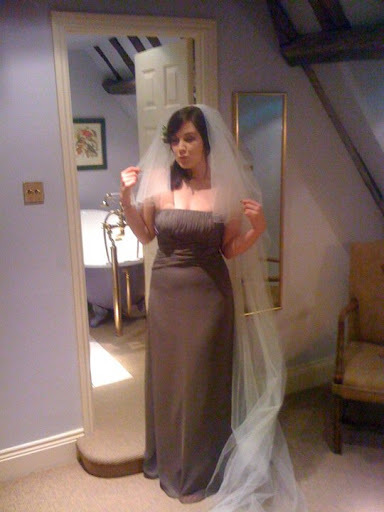 I always wondered how I would feel the day before my wedding, and in all honesty I was still not nervous and only marginally teetering on excitement. It was market day in town and we had numerous errands to run, from dropping off our favours to picking up Americans from the station. I was still mentally occupied with little tasks that I had almost forgotten why everyone was here. We then had a church rehearsal at 6pm. (I advise all brides to do this the night before) Miss Pickering had put all of the flowers in place and they looked absolutely stunning. We went through what was going to happen, I messed up all the lines and stood in the wrong place but I felt better knowing what the general order would be. Then it hit me. Hot flash and slight wooziness followed. I was getting married in less than 24 hours. Crap, the nerves had hit. I then had arranged for everyone that had travelled to Stamford to meet in a bar. Slowly it filled with all of our family and friends…this made it worse. I was now officially, for lack of a better word, bricking it. My mother had given me a curfew of 9pm. We arrived home. I had a bath and she made me some toast. I of course didn’t sleep, it was one of those nights where I heard the bells chime every hour on the hour. Saturday the 20th of November arrived with grey skies and a mighty chill. 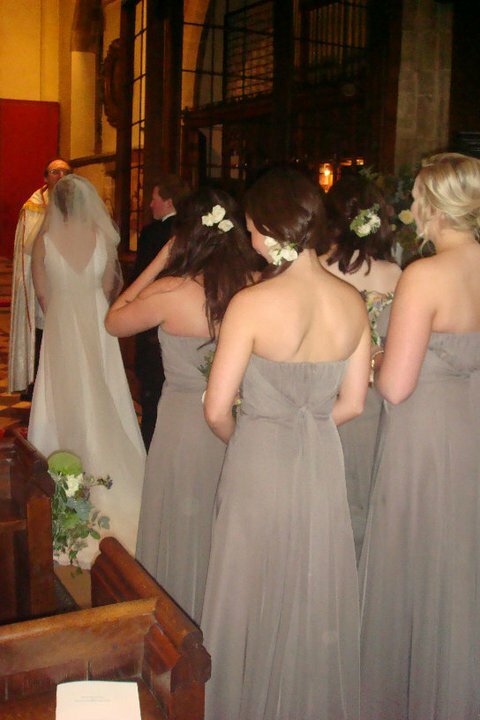 I woke at 7.30 for hair and make up, and as my beautiful bridesmaids arrived, I realised they were just as nervous, I calmed down and the nerves turned into the most overwhelming excitement. By the time I had got into the car (in the attempted manner of Grace Kelly) I was completely serene. And I was on my way to becoming a wife. Next installment…what it felt like to arrive at the church. 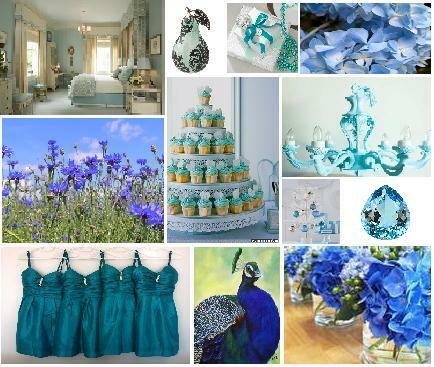 With so many exquisite shades, blue is a fantastic colour to add to a wedding. And I think it makes a beautiful change to the ever so dull (and slightly passé) red/pink/ivory colour schemes. From cold, icy baby blue, warm royal blue to breath taking cornflower and peacock blue, the colour can be used at any type of wedding, any time of the year. Flowers, dresses, ribbon, favours, decor, drinks…there are numerous ways to incorporate this vivacious colour into your wedding and I think it deserves a comeback. Be Bold. Be Brave. Be Blue. 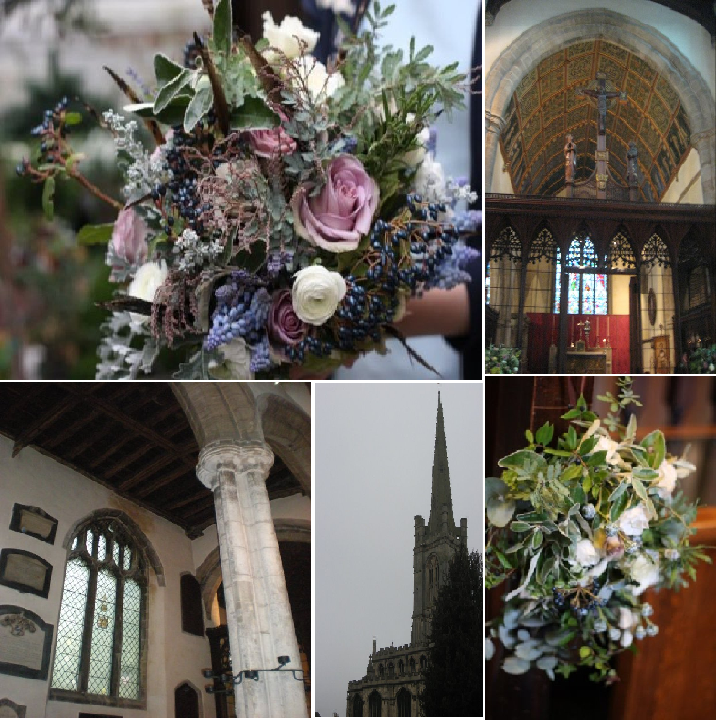 As the saying goes…And technically I am getting married in a church that dates from the late 12th century and our reception venue is more than 900 years old. But I reckon this doesn’t count. So I will find an alternative in heirloom couture. 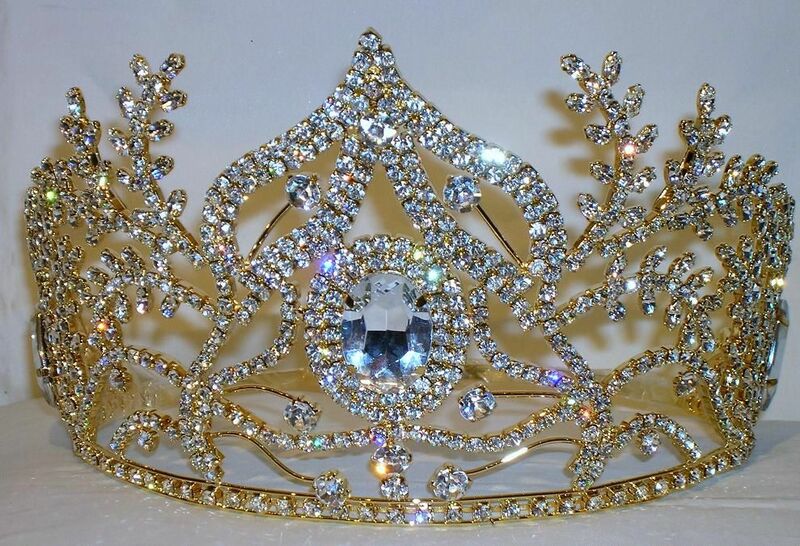 Use antique silver, gold, glass and crystal to decorate your venue, vintage invites and favours for the guests and old furs, antique jewels and hoary accessories for the bridal party. These can be easily sourced from local antique centres and online so bring you antiquity A-game and get hunting! Beautiful antique inspired decor from LeTrousseau, vintage favour boxes and postcards from VintageTwee and a fantastic London antique shop found here. The vintage clutch is from a brilliant blog and if you can afford it, this is where the crown is. It’s a cliche. But it was love at first sight. It was my very first night out at University in Scotland. I was miles from home and I knew no one. Armed with gin and some over zealous freshers we ventured into the unknown…the Student Union. I sat down at a large table, it soon filled with eager newbies wanting to make friends. We drank, we laughed, we drank more…we laughed non-stop. And then it happened. He walked in with five or six friends, I clocked him. Someone in their group happened to know a guy on our ever expanding table, and the male group joined us. Now this is where one shouldnt judge…I got up, went over to him, and asked if I could buy him a drink. He accepted, we went to the bar, I charmed him with my intelligent wit, dazzled him with my smile and flicked my hair now and again. He then told me something that to this day I still dislike him for.”I have to warn you, when girls like me, they realllly like me”. Well. I stood there quite shocked, in my head I had a small debate whether I should walk off now, or stay to prove him wrong. Unfortunately he was right as I’m marrying him in less than three weeks. Five years on I can still remember that night so clearly. The night I met my husband.